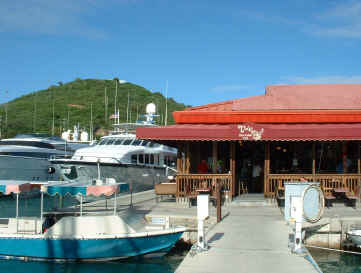 Nestled in Crown Bay Marina, just a 5 minute drive from the airport, Tickles Dockside Pub offers a friendly and relaxing atmosphere. From this casual open-air restaurant you can enjoy the beautiful Caribbean Sea, sailling vessels,mega yachts, and some of the world's largest cruise ships. Treat yourself to favorites like fresh Conch Chowder, BBQ Babyback Danish Ribs,Tequilla Chicken, or Conch prepared in a West Indian Butter Sauce. 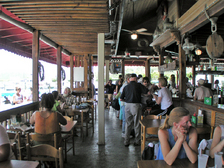 Tickles Dockside Pub serves Breakfast, Lunch and Dinner 7 days a week from 7AM 'till 9:30 PM. 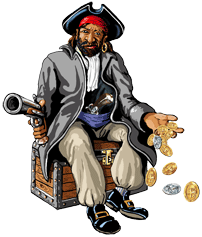 And don't forget our fresh desserts, locally prepared-Mango cheesecake,Pieces of Eight Chocolate cake, Chocolate Peanut Butter pie, and, of course, Key Lime pie! We have a full service baruntil midnight, so you can enjoy your favorite cocktails and also try one of our famous 'Bushwackers'. 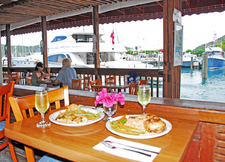 Tickles Dockside Pub also has a fine wine selection that will compliment any of our entrees. Check out our Events for live music and entertainment. We look forward to enhancing your Caribbean experience, whether you live here or are visiting!